Global Market Insights has recently added a report on Snow Blowers Market which provides a succinct analysis of the market size, revenue forecast, and the regional landscape of this industry. The report also highlights the major challenges and current growth strategies adopted by the prominent companies that are a part of the dynamic competitive spectrum of this business sphere. North America and Europe snow blowers market includes giant multi-national players to local medium scale companies. The industry includes many prominent vendors such as Ariens, MTD Holdings Inc., Honda, Husqvarna AB, Briggs & Stratton, Marcel Boschung Ag, John Deere, RPM Tech Inc., Aebi & Co. AG Maschinenfabrik, The Toro Company, Zhejiang Dobest Power Tools Co. Ltd., Overaasen As, Stiga Spa, Kubota Corporation and Caterpillar. Industry players operating in the snow throwers market constantly indulge into new product development, acquisition and joint ventures strategy. For instance, In March 2018, Toro acquired L.T. Rich Products, a maker of commercial zero-turn spreaders/sprayers, aerators and snow and ice management equipment. The move is to expand offerings to landscape and grounds professionals. North America and Europe Snow Blowers Market is forecast to exceed USD 217 million. 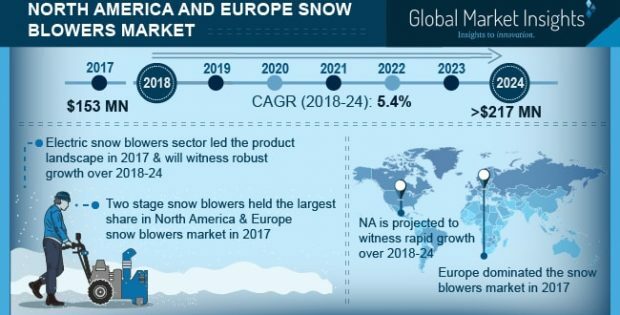 North America and Europe snow blowers’ (Snow Thrower) market will be primarily driven by robust motorways connectivity along with high snow fall in the region, which is consistently growing over past few years. Traditionally, North America and Europe are known for the heavy snow fall. Motorways connectivity in these regions are increasing substantially, especially in hilly regions where snow fall is generally high. This increased connectivity in these regions is projected to fuel the snow blowers market over the forecast period. For instance, in 2010 total motorways length in the Europe was 71,192 km and it is expected to reach 85,281 km by 2025. With increasing connectivity and motorways length, product demand in the region shall increase over the forecast timeframe. Many different equipment are used to remove snow. Compared to other equipment, blower is very effective medium to remove snow well. The available alternatives to snow throwers include angle plough, spreader, snow pusher and scrapper. These products are available in market at a price comparatively lower than snow blowers, which may hamper product demand over the forecast timeframe. Cordless snow blowers are likely to gain more prominence during the forecast period. This can be attributed to its low cost and high mobility. 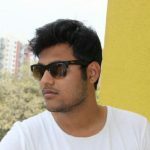 Owing to low product cost coupled with high operational efficiency, middle income group consumers can also afford it, thus increasing product demand from this stratum of end-users which in turn will drive cordless snow blower market growth from 2018 to 2024. Among the three power types of snow blowers available in marketplace, two stage snow throwers demand will grow with highest CAGR during the forecast period. Two-stage snow blowers can throw the ice at long distance and are effective in areas receiving heavy snow fall. In 2017, Europe held the largest market share in snow blowers market. This can be attributed to the high disposable income of people and most of the snow receiving regions are in Europe. Owing to the increasing global warming, snow fall in North America is increasing rapidly. Due to this, North America is projected to expand with significant CAGR during the forecast timespan.